Our design team created distinct custom arrangements for Kyle & Thomas's special day at The State Room Boston. 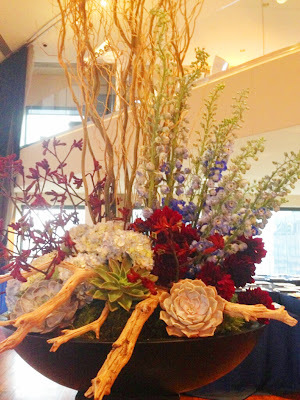 The first was an elevated modern & masculine design of curly willow, light blue delphinium, burgundy kangaroo paws collared by gold mokara orchids. The second was a low design created in leaf lined clear glass vases with light blue hydrangea, mango calla lilies, loops of aspidistra leaves, blue thistle, orange roses, mokara orchids & burgundy dahlias. To view more photographs from this wedding, click here.